Muhammad and Musa have GRADUATED from Homeschool! Now they are pursuing their Masters in Quran Studies. After 11 years with Muhammad and 10 years having them under our arms, we finally found the best place for them. We are ready to give the to Islam and to be the Khadam or servant of Al Quran. The best part of this school is that parents are encouraged to participate actively. Three times a week there’ll be a Takirah session where parents can join and also another Khatim session. More report will come…In Shaa Allah. The kids have grown up. The best thing is they grow up right in front of our eyes. Muhammad is now nine (and I really thought he was 10 already!). Musa is catching up in height, he’s turning 8 this November. Maryam who will turn 6 has shown tremendous progress, alhamdulillah. She’s been composing songs :). Little Sarah, my December baby is reaching 3 this year. And me..almost touching my mid-30’s now. Can’t wait to be 40 (oh..panjang umur, luas rezeki). These past few months we’ve been approached by three concerned couples who are seriously considering homeschooling. Of course, the number 1 question is: Is this legal? The way Ridz and I answer this question depends on the way it is being asked, who is asking and WHY the person is asking. After numerous encounters with this issue, it’s time we put this in writing. When I think about why we choose to homeschool, one of the factors would be our education background. Where Ridz and I attended school. Yes, the more I think about it, the more obvious it becomes. From Year 1 – Year 6, we attended the normal school system. Learning the KBSR way. School was fun back then. However, for secondary education both of us experienced a different system from the mainstream. The best thing is our background is really in contrast. 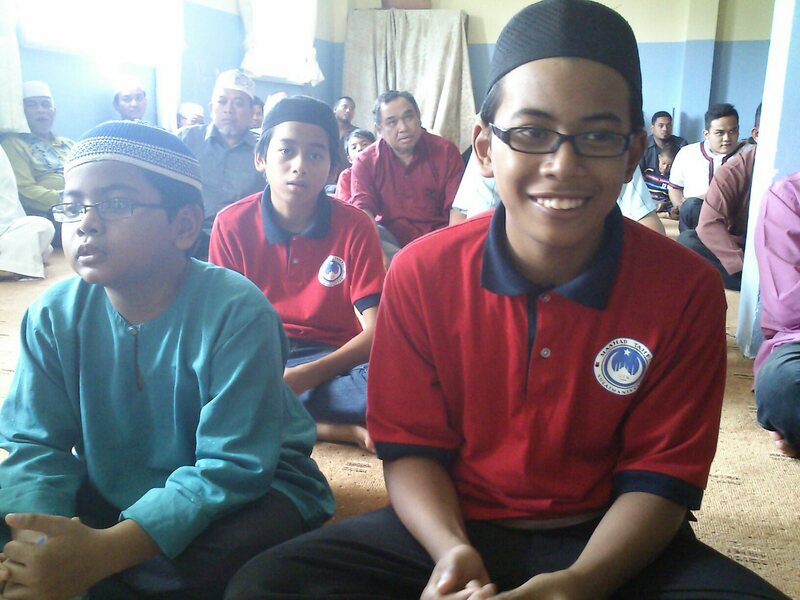 Ridz was sent (note the passive phrase – was sent-) to a religious school, or commonly known as sekolah pondok. Those days sending your kids to religious institution became the last resort to reform your child. Read: to transform a naughty boy into a good one. In this case, my significant other was once a notorious kid on the block..hahah NKOTB. His first pondok was literallly a pondok (hut) back in Pondok Lanai, Kedah. He survived for 7 days only. Imagine, at the age of 13 this boy had to buy his own fish and cook on his own. Emm..shocking, eh? So with one tearful phone call from a public phone booth 1km away, the parents took him home. Hold on, he did not live happily ever after because this is not a fairy tale, sister. 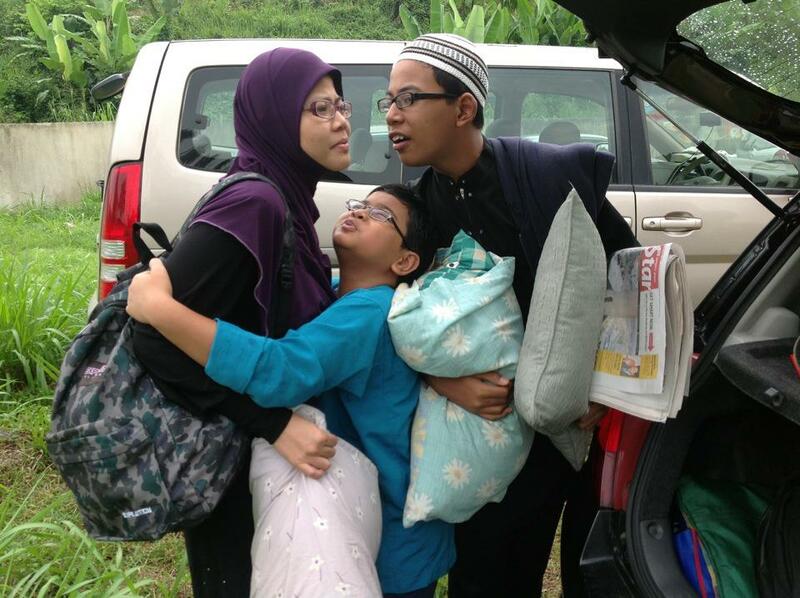 On the same day, right after the parents fetched him from Pondok Lanai, they transported him to another pondok. Madrasah al-Masriyyah in Bukit Mertajam. That’s Ridz. And now, me. I spent my teen years in a little town called College Station, nicely tucked in the state of Texas, US of A. My mom pursued her PhD at the age of 40 plus and she brought us along. My high school was A&M Consolidated High – this is where I brushed up my English (Texan style) and enjoyed a different style of school system. What a mind-opening experience! I learned Spanish, tried out for the Track team, represented school for Duet Acting. From ESL (English as a Second Language) class, I upgraded myself to Honors Classes. And best of all, I realize that life can still be fulfilling without SPM! That’s right, I did not sit for SPM, nor PMR. (Oh, I did get 5As for my UPSR and top of the list for Sijil Darjah Enam in my sekolah agama). I can never work for the Malaysian government unless I choose to sit for SPM. Thanks, but no thanks. (Remind me to share an anecdote of my interview for KPLI). So, against this background, Ridz and I have no qualms about choosing an alternative schooling system for the kids. We are not the product of the Malaysian mainstream education and so far life is still blessed. Alhamdulillah. 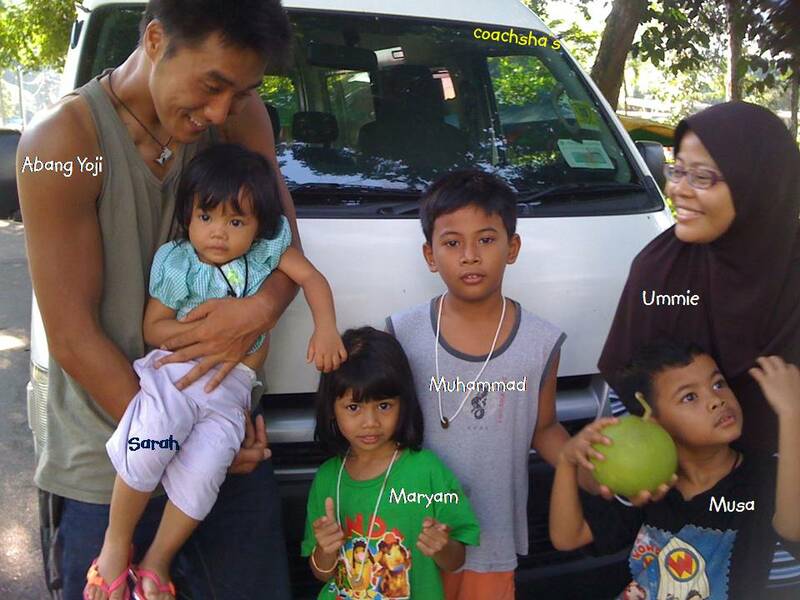 Hence, our approach to bringing up the four kiddos is a blend of both worlds – Ridz’s pondok plus Sha’s high school. Having said this, our homeschooling style is unique to us and can’t suit other homeschoolers. This is what H-S is all about. It’s about parent’s power and empowering parents to choose what they want for their kids. You decide what you want to achieve at the end of the day. That’s why when people ask HOW we homeschool, we answer with WHY we homeschool. It’s the WHY that matters most. The HOW comes next. So, back to the question “Is it legal to homeschool?” look at it this way. If it’s not legal then it’s illegal. Meaning it’d be considered a crime. I don’t know. If we do not enroll our kids in the normal, mainstream system, would this make us criminals? Hahahaha…sounds extreme, huh? But joke aside, think about it for a moment. You decide. (1) The Minister may, by order published in the education Gazette, prescribe primary education to be compulsory education. (2) Every parent who is a Malaysian citizen residing in Malaysia shall ensure that if his child has attained the age of six years on the first day of January of the current school year that child is enrolled as a pupil in a primary school in that year and remains a pupil in a primary school for the duration of the compulsory education. (3) The Minister may, if he considers it desirable and in the interest of the pupils or the public to do so, by order published in the Gazette, exempt any pupil or any class of pupils from the requirement to attend compulsory education, either absolutely or subject to such conditions as he may think fit to impose, and may at any time in his discretion revoke the exemption or revoke or alter or add to such conditions. (4) A parent who contravenes subsection (2) shall be guilty of an offence and shall, on conviction, be liable to a fine not exceeding five thousand ringgit or to imprisonment for a term not exceeding six months or to both. (5) The Minister may make regulations for the carrying into effect of the provisions of this section. Note that compulsory education applies only to Primary School. Secondary school is presently not mandatory under the above Act. After Standard 6, Malaysian students are not compelled to be enrolled in a Secondary School and a child may choose to continue formal education in a private or public school, or abandon it altogether . The curriculum used must be the National Curriculum in the main, while others could be used as supplement. The curriculum, timetable and methods of assessment used. Allowing an officer from the ministry to monitor the progress. Enjoy the process of bringing up kids and becoming parents.